A coal-fired power plant at sunset. 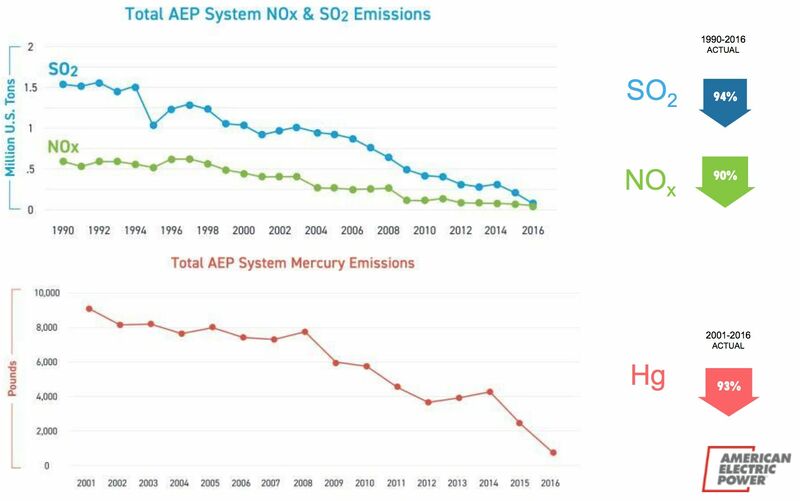 AEP isn’t traditionally thought of as the most environmentally friendly utility, but that reputation is changing -- marking arguably one of the most significant endorsements of clean energy technologies to date. In 2005, coal made up 70 percent of AEP’s generation capacity -- which is how the utility measures its electricity mix today. Since then, coal’s share of capacity has dropped to 47 percent. 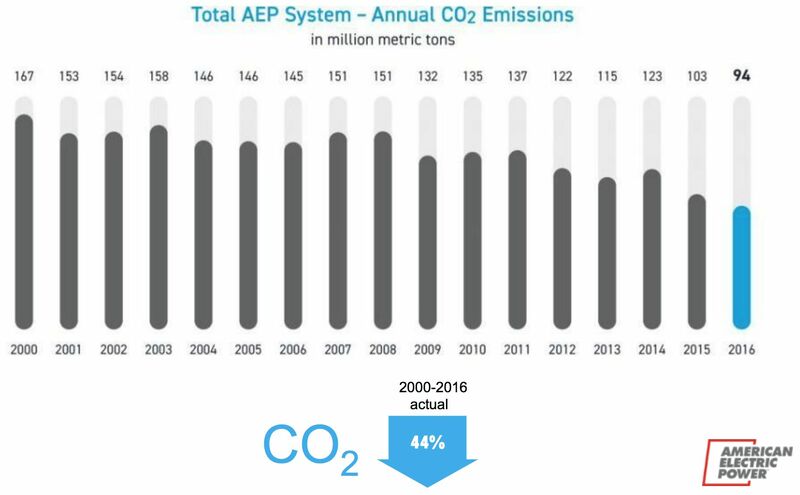 At the same time, AEP’s natural gas capacity increased from 19 percent in 2005 to 27 percent today, and renewables entered the scene in a meaningful way, growing from 4 percent in 2005 to 13 percent today. 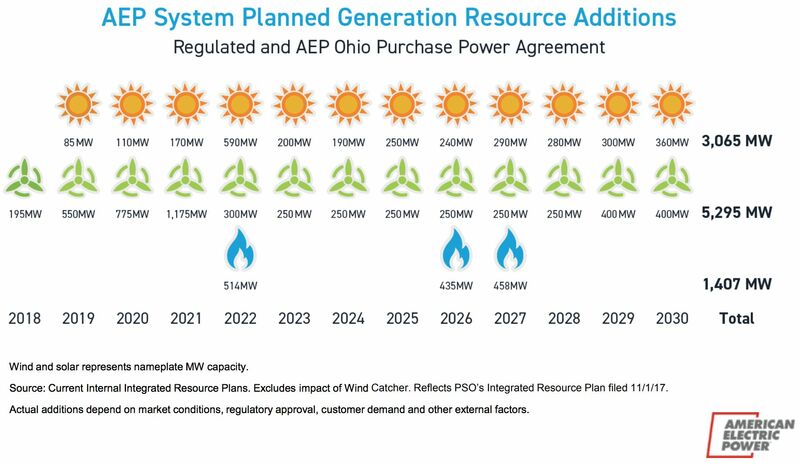 Renewable energy is now slated to make up the vast majority of AEP’s planned generation additions over the next decade. In AEP's third-quarter 2017 earnings report, the utility said it plans to add another 8,360 megawatts of wind and solar through 2030 across its regulated and deregulated businesses -- and that doesn’t even include the 2,000-megawatt Wind Catcher project, which could become the largest wind project in North America. “To think a utility that was at one time the largest coal-burning utility in the Western hemisphere, that that's where our focus is,” Patton said, remarking on AEP’s strong embrace of clean energy. "We don't even have gas on the horizon; it's all wind and solar"
Overall, AEP plans to invest $18.2 billion in capital from 2018 through 2020, with 72 percent of that focused on its transmission and distribution operations. “Today, we are solely focused on making the right investments to be the energy company of the future including modern, smarter infrastructure; advanced technologies; and cleaner generation,” said Nicholas Akins, AEP’s chairman, president and CEO, in a statement. But while AEP is retiring many of its coal assets, it’s not as though coal will disappear from AEP’s mix tomorrow, Patton said. 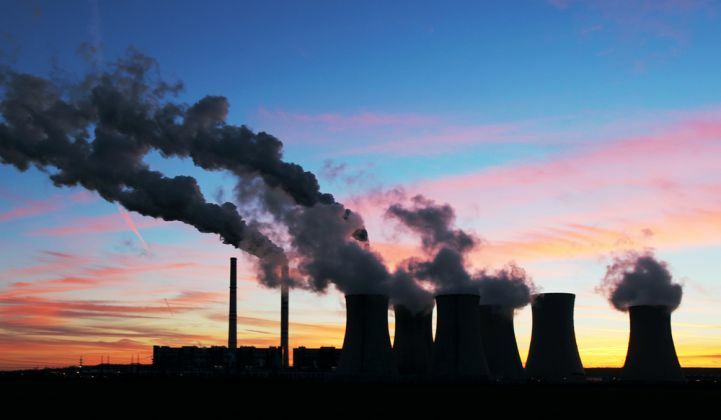 For instance, there are coal plants owned by AEP subsidiary Appalachian Power, where Patton served as president for seven years, that cost more to make EPA-compliant than to build in the first place. As a result, these plants will be tough to abandon. Appalachian Power has already retired around 3,000 megawatts of coal, and the remaining coal plants in its fleet scheduled to retire by 2040. In the meantime, virtually all of the utility’s incremental supply is slated to come from wind and solar. “We don’t even have gas on the horizon right now; it's all wind and solar,” Patton said. DOE's plan to shore up coal and nuclear is "a blanket grant to a few"
It’s difficult to appreciate how hard it is for an economy to shift away from coal, until you’ve lived in coal country, Patton said later in an interview. While traveling through southern West Virginia, it’s all too common to see communities brought to a standstill by the decline in coal demand, he said. He recalled seeing mom-and-pop companies struggle as their trucks, once used to haul coal, sat idle in a field. Now, AEP finds itself pushing back against Trump’s Department of Energy over its notice of proposed rulemaking that seeks to prop up coal and nuclear. Patton said AEP has filed in opposition to the NOPR, but is open to having a more nuanced discussion on how to ensure grid resilience and reliability. “We thought that the DOE was correct for being concerned about reliability; however, we believe what should happen is we should partner with the North American Electric Reliability Corporation to determine what ancillary services and reliability services are needed [and] where are they needed, and then try to figure out appropriate pricing for those attributes,” he said. One of the biggest challenges to building the massive 2-gigawatt Wind Catcher project has been the opposition from independent oil and gas companies in Oklahoma, Patton said. “There are oil and gas interests in Oklahoma who really don’t want to see this built,” he said. There are two reasons for that. First, he said, they don’t like subsidies of any sort, and dislike that AEP plans to take advantage of the wind Production Tax Credit (PTC) before it expires. Second, they see the wind project as a direct competitor. Wind Catcher is subject to review in four states: Oklahoma, Texas, Louisiana and Arkansas. AEP is hoping for speedy approval of the $4.5 billion wind project, including the 350-mile power line that will connect it to population centers, before the PTC phase-out begins in 2020. Between the PTC and the energy costs projected for the Wind Catcher facility -- which Patton said has a capacity factor he never thought possible -- AEP can invest $4.5 billion and actually lower customers’ rates, he said. But while the PTC is a critical piece of the economics for Wind Catcher, AEP is pursuing wind and solar “with or without tax credits,” he added. Patton said he’s amazed at the tunnel vision in Oklahoma that could lock out billions of dollars of local investment from Wind Catcher. He chuckled when asked if he was surprised at how his own views have evolved on renewables, acknowledging that utilities have also struggled with the advent of cheap renewables and other advanced grid tech, because they’re typically incentivized to preserve the status quo.